What most people envision or hope for when walking their dog is a picture of harmony: The dog leisurely strolling along next to them, no pulling, no zigzagging, and no charging at other dogs or people. Unfortunately, adjusting to their human’s pace is something that dogs rarely do by default. To rectify this, the dog training profession has come up with a range of measures from choke chains and prong collars to various harnesses and head halters. Equipment of that type can be more or less successful in thwarting the dog’s efforts to follow their own agenda, but it doesn’t necessarily result in harmony. A better, more cooperative approach is leash training. When I was younger I had a friend with an annoying habit. Her walking pace was slower than mine, so every time I walked ahead of her she tugged at my sleeve in order to slow me down. But only seconds later I would again be a few steps ahead since my friend’s pace simply wasn’t my pace. In fact, I’m convinced that it cost me more energy to keep a slower pace than to trot along at my own natural pace, apart from the fact that the frequent tugging irritated the $@#% out of me. Of course my friend was also clearly annoyed by having to try and keep up with me all the time. Maybe it is because of this personal experience that I sympathise with dogs on leash. If I find it so difficult to match my pace to that of another human, just how hard must it be for a dog to fall into line with one of those slow moving humans. Unless a dog is old, sick or otherwise impaired, they usually walk at a faster speed than we do. In fact they don’t walk, they trot. They are like window shoppers. Instead of moving at a consistent speed in one direction they trot from smell to smell and linger until they have collected all the info that can be found there. If they do happen to keep to a straight path, it typically involves a clear goal, for example the dog park or some other irresistible attraction. Of course I also understand the frustration of humans when their dogs seem to ignore them in favour of smells, other dogs or whatever the environment has to offer. It’s no fun having your arm pulled out or being tripped up by your dog zooming in front of you. According to traditional dog training my friend used the wrong technique. Instead of nagging me with those frequent sleeve tugs, she should have grabbed me by the collar – just once – and pull it tight so violently that I’d gag and struggle for air. Apparently this rather shocking experience would have forced me to walk at my friend’s slower pace for good. Somehow I doubt she would have been a friend for much longer after that. Causing a one-off traumatic experience is exactly the philosophy behind choke and prong collars. You are supposed to yank at your dog’s neck so hard the first time you use the collar that you will never have to yank again. One massive yank and your dog’s pulling on lead will have been solved for life. Apart from the fact that this treatment risks the dog’s health and even life, how could anyone actually want to do this to their dog? One explanation why this technique is still widely used could be the desensitisation of people to violence in dog training. I had to witness a demonstration on the “correct technique” to use a choke chain when a former instructor of mine yanked a client’s dog around in front of the whole class. Today, under the same circumstances, I would suggest the client quickly take their dog and get as far away from that person as they can. Instead I stood silently, together with everyone else, while we were lectured on the dog’s experience. It didn’t matter that the dog yelped every time he was catapulted backwards. It wasn’t pain we were told, the dog was just surprised. What exactly a dog feels when all of a sudden the chain around their neck tightens, digs into their throat and hurls their body back, we will never know. But I think we can make an educated guess that the experience is not pleasant. If the procedure succeeds in stopping the dog from pulling, then it must have been painful or frightening enough, so the dog will want to avoid the experience in the future. Chances are the dog will also become wary of the person holding the leash. Moving forward, there are more humane solutions these days to stop a dog from pulling. However, even harnesses and head halters rely on thwarting rather than training. Front clip harnesses which have the leash attached to a clip on the dog’s chest rather than their back, work by pulling the dog’s body sideways when the dog pulls forward. Some dogs learn to walk that way, i.e. they still pull but walk sideways at the same time, leading to an awkward gait which could cause health problems in the long term. Other harnesses tighten around the body or even the throat to prevent pulling. Head halters are generally not readily accepted by dogs and it’s better to desensitise them to wearing this equipment (preferably in combination with counter conditioning). Otherwise the dog may forever try and get the thing off their face rather than enjoy the walk. Head halters can be dangerous if the dog still pulls or the leash suddenly stops the dog’s forward movement with a violent head turn. Compared to choke and prong collars, these types of walking aids are clearly preferable but a thoughtful approach is required. As long as the dog seems comfortable and doesn’t suffer side-effects, harnesses and head halters can be a very good solution. It can even mean the difference between the dog being walked or not at all. Ideally, though, the use of these mechanical aids is partnered with training, so the dog doesn’t feel the need to pull anymore in the first place. Truly walking together in harmony requires that dog and human pay attention to each other. Neither dragging a dog nor being dragged results in a pleasant outing. It’s worth reminding ourselves that dog walking is primarily for the dog’s benefit. It’s about sniffing and investigating, taking in sights and sounds, marking here and there and having toilet breaks. These are important activities for a dog and given that many dogs spend countless hours alone in their homes, a “walk around the block” in the evening is often the only daily excursion they get. For us humans walking the dog clearly has benefits too. It gets us outside and moving and it’s a chance to have some “us” time with our dogs. If we tune in to our dog’s activities and experiences on walks we can learn more about them and increase the bond we share. We can make our dog, as well as other dogs and people, feel safe by keeping an eye on our surroundings, moving away from situations if required and monitoring our dog’s interaction with others. Paying attention is of course also useful in preventing doggy stomach aches due to ingestion of unidentified objects. Teaching a dog to walk at our pace means making it attractive for the dog to adjust their natural movements and slow down*. It requires time and patience. If the dog is a strong puller, it’s a good idea to start off with a harness or head halter to get a foot in the door. Otherwise the frustration levels – especially the human’s – might be too much to do any effective training. The dog must then be heavily rewarded, starting in a no distraction environment and with tasty treats, for walking within a given semi-circle next to our leg. The most important thing though is to frequently allow the dog to do all those worthwhile things on walks like visiting a tree or lifting a leg. If these are used as rewards for not pulling, everyone wins. Another important point is not to use the leash to move the dog around. A leash is simply a safety device, nothing more. To move the dog about, we are much better off encouraging the dog verbally to come to us or with us or directing them with hand targeting**. In another world in a parallel universe dogs may be walking and running freely without the need to be tethered to us. Unfortunately ours is a dangerous world and full of restrictions. 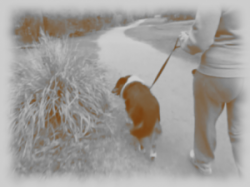 But with some thought and effort we can make walking together a more enjoyable experience for us and the dogs. There really is no need to punish dogs for being dogs. * In case a dog moves slower than their handler, the human needs to slow down too. Unless the dog is old, disabled or injured, a dog can be encouraged verbally or with treats to pick up pace. However it’s important to be mindful about possible reasons the dog is unable or unwilling to walk or walk faster. These can be physical health reasons or even fear or anxiety. A vet check should be considered and – if this does not result in anything – a veterinary behaviourist or good dog trainer may be able to help. ** Hand targeting is a useful behaviour where the dog aims for and touches the outstretched hand of their handler.